Posted on Mon, Jan 30, 2012 : 12:50 p.m. The property at 443 S. Division St., where the rubble will be cleared this week, according to U-M. The corner of South Division and East Jefferson is getting a new look: The University of Michigan demolished the three-story former rental on the site over the weekend. U-M bought the property at 443 S. Division in 2010 for $805,575. It also bought the neighboring house — once home to playwright Arthur Miller — for $919,425. The buildings are adjacent to the Institute for Social Research, which is expanding. U-M officials said the 443 property would be used for a parking lot for the contractor working on the project. The neighboring house will be used by contractors during the expansion. 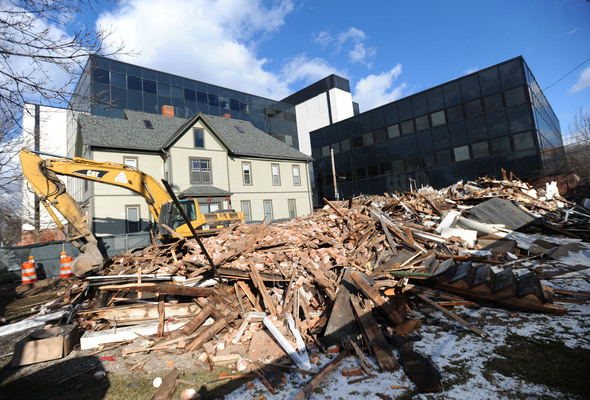 The demolition originally was scheduled for last weekend, but was moved to Jan. 28. Tue, Jan 31, 2012 : 2:21 p.m.
As you cry the woes of yet another property taken off the tax rolls by U of M, think about Ann Arbor without U of M. What would Ann Arbor be if U of M was not located in this area? While the U of M may not pay taxes, think of the tens of thousands of students, staff, faculty and visitors that it brings to the area who do pay taxes and shop at local stores and restaurants. Much of Ann Arbor thrives due to U of M and its many non tax paying operations. Mon, Jan 30, 2012 : 11:33 p.m. I'm looking at the plus side to this, after the university buys up the entire town none of us will have to pay local taxes, just rent to the university. The university doesn't seem to be hurting so once eh start their own fire dept and increase their police dept life will be good. Mary Sue Coleman, President of Washtenaw County Lol!!!! Mon, Jan 30, 2012 : 9:51 p.m. It was sort of an ugly house and a block away a new private dorm is being built. I guess space in ISR for a few more jobs must displease some folks commenting here. Of course, we don't need anymore jobs, especially from our institutional overlord. Oh the humanity of it! Mon, Jan 30, 2012 : 9:48 p.m.
Mon, Jan 30, 2012 : 9:22 p.m.
Another expansion of the U of M Department of Counting Things will improve efficiency of government coercion. Mon, Jan 30, 2012 : 9:21 p.m.
<a href="http://ns.umich.edu/new/releases/7543" rel='nofollow'>http://ns.umich.edu/new/releases/7543</a> If you're interested in the UM press release about this, last February. Mon, Jan 30, 2012 : 9:08 p.m.
Ok, site the study name and center in which it is running. There are many, many studies being run at the Institute for Social Research and to imply that this is somehow significant really does indicate a poor understanding of statistical relevance. But, on the plus side, you may have misinformed some people and riled them up. Mon, Jan 30, 2012 : 8:40 p.m.
That doesn't seem like a new look. It looks pretty much what a lot of downtown Ann Arbor is starting to look like. Mon, Jan 30, 2012 : 8:14 p.m. Foolish me. Each time I recently drove past the fenced property and saw the construction equipment, I foolishly thought someone was getting it right and actually restoring the beautiful old house. Is nothing treasured any more? Does everything with a history have to be eliminated and replaced with yet another new, barren box? Wow, beautiful is really not a word I would use to describe that building. It was a nondescript brick building painted white with rickety balconies on the side facing the ISR building. Not exactly a gem. Mon, Jan 30, 2012 : 8:10 p.m.
Paula: What is your source for 443 S. Division once being the home of Arthur Miller? So far, I've only been able to link him to houses on North State, but students and other boarders weren't always reliably recorded in the city directories. Thanks. Mon, Jan 30, 2012 : 8:09 p.m. Soon all jobs will be either University of Michigan (or some derivative company), or food service. How about a &quot;before&quot; picture? Tue, Jan 31, 2012 : 12:13 a.m.
Mon, Jan 30, 2012 : 11:46 p.m.
Bear, I go by there several days a week, and I was still trying to remember which house it was. A picture would have helped me visualize it. Asking for one isn't some kind of gaffe. Mon, Jan 30, 2012 : 11 p.m.
Mon, Jan 30, 2012 : 8:23 p.m.
you mean you aren't familiar with the area? Never been by the place before? Have no idea where the ISR building is? Then what do you care? Mon, Jan 30, 2012 : 7:41 p.m. When somebody tears down old houses to build apartments (that actually pay taxes) there are articles for weeks about how bad it is for Ann Arbor. When U-M tears down old houses (removing them from the tax rolls forever) there is one short article after the fact. Mon, Jan 30, 2012 : 7:14 p.m.
Ann Arbor = University of Michigan. No big deal if you just want to bury Ann Arbor's history. Tue, Jan 31, 2012 : 2:55 a.m.
City Place aka what use to be German Town. Remember who built Ann Arbor in the first place. Their beloved homes are now gone to students. Mon, Jan 30, 2012 : 8:33 p.m.
We should change the city limits sign to read Welcome to UM Inc.
Mon, Jan 30, 2012 : 7:19 p.m. However, history writes that Ann Arbor is what it is today due to the University of Michigan. So, one must be careful of the hand that feeds, and understand sometimes the hand givith and other must takith. .
Mon, Jan 30, 2012 : 6:51 p.m. So what kind of system do the overlords use? 1-Supreme executive power derives from a mandate from the masses, not from some farcical aquatic ceremony (because lets face it, you can't expect to wield supreme executive power just because some watery tart threw a sword at you and if you said some moistened lady lobbed a scimitar at you, they'd put you away). 2-By exploiting the workers. By hanging on to outdated imperialist dogma which perpetuates the economic and social differences in our society. 3- I told you, we're an anarcho-syndicalist commune. We take it in turns to be a sort of executive officer for the week. Mon, Jan 30, 2012 : 7:49 p.m.
scim·i·tar (sm-tr, -tär) A curved Asian sword with the edge on the convex side. Bedevere, tell me again how you can employ a sheep's bladder to prevent earthquakes. Mon, Jan 30, 2012 : 7:11 p.m.
Mon, Jan 30, 2012 : 6:01 p.m. Yet another property taken off the tax rolls by our Institutional overlords and less housing for their paying serfs.